Anjum Hasan is a gifted young writer. She is the author of Lunatic in my Head (Penguin-Zubaan, 2007), a book of poems Street on the Hill (Sahitya Akademi, 2006), the novels Neti, Neti (Roli, 2009) and a collection of short stories Difficult Pleasures (Penguin, 2012). She is also the Books Editor of The Caravan. I clear my throat. It is such a difficult pleasure – talking. 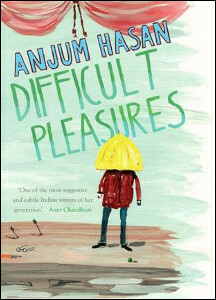 Anjum Hasan’s Difficult Pleasures is a collection of thirteen short stories, set in real places, involving people and feelings we might all have known. These are lonely people, their emotions melancholic, their homes urban and the pleasures they seek full of trepidation. Does grief demand occasion? Or do bewilderment, heartbreak and helplessness weave through the comforts of the mundane? How do modern, urban people deal with loneliness? Do art and philosophy provide a shelter, or do they startle us deeper into our own vulnerabilities? The book doesn’t answer these questions; rather it asks the reader to embark upon the same journeys as those of its characters. Most of the stories occur in the minds of the characters, drawing the reader into the mental landscape of the narratives. No one seems to be telling these stories; they are dream-like. Hasan’s brilliance shines through in her choice of situation and emotional space. These are situations people usually don’t think and talk about, let alone spin stories out of, yet she manages to make them feel somehow familiar. In these stories, we meet characters of all ages, driven by a wide-variety of emotions and ambitions: little children who are scared or cynical, young people who want to be photographers or doctors, adults who are editors and economists and old women who want to be good housekeepers or secluded painters. We are also offered unapologetically intimate snapshots of their lives and relationships. We feel like we are with Science when he loses his photography mentor in Bombay or Neel, as he dizzily prays for his alcoholic father to attend his school play or Sameer, already motherless, as he loses the only home he knows. There is a sense of inevitability to these characters, as they wade through the strange and difficult moments in their lives. Most, protagonist or otherwise, have remarkable traits and idiosyncrasies, which demand our attention. Take, for example, the landlord, Mr Bhatkal, who foretells how long stored water will last and saves with pride newspaper clippings mentioning his hometown, even if describing a suicide; or the mysterious English professor, Jagdeep, who is “hesitant and shy and British. Even his laughter was tentative, as if laughing at something, anything is going too far.” There is also the philosophy student, Francis, who becomes a drug dealer and is now “cooling his heels in prison.” And then there are the brothers Banerjee and Banerjee, one of whom commits suicide, while leaving a book behind for his estranged brother to find. The last page of the book has a sentence that the surviving Banerjee will not easily forget. And neither will the reader. Several stories in this collection are reminiscent of Hasan’s first novel, Lunatic in My Head, and cover some of the same themes, especially relating to the arts. 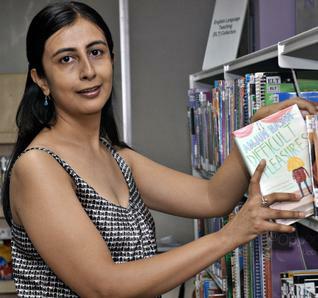 In her writing, Hasan is drawn to cultural topics, including music (rock music in Lunatic in My Head), books (The Old Man and The Sea inLunatic in My Head), artists (Max Ernst in “The Big Picture”) philosophy (Kant’s categorical imperative in “Immanuel Kant in Shillong”) and poets (Christina Rosetti in “Good Housekeeping”). More than simply being part of the setting, however, these cultural elements prove integral to the stories, as well as inviting the reader to form their own connections with them. “The Big Picture,” for example, couldn’t have been told if it weren’t for Max Ernst, and the final sentence of “Immanuel Kant in Shillong,” with its philosophically challenging implications, would not have the same force without the inclusion of Kant’s ideas in the story. And one wonders whether “Banerjee and Banerjee” would be as provocative without Fyodor Dostoyevsky’s The Brother’s Karamazov. For a writer, finding inspiration from pieces of art and inviting readers to form their own relationships with these pieces are two different things. Anjum Hasan does both. While bursting with people and thoughts, the stories in Difficult Pleasures are more about stillness than movement, so, as the title suggests, the book can at times be challenging and slow. In her own words what Hasan enjoys most is “…daydreaming about other people’s lives,” and that is exactly what she lays down on the page. Hasan invites us to be witnesses to her thoughts and day-dreamed scenes, and manages to do so without sentimentality or demanding a particular emotional reaction from her readers. My favourite stories are “The Big Picture,” “Immanuel Kant in Shillong,” “Hanging on like Death” and “Banerjee and Banerjee.” Some other pieces, however, do not work as well. For example, in “Revolutions,” the character Darshini is not depicted clearly, and in “Wild Things,” Prasad’s school actually seems more exciting than his rebellious day out in Bangalore. Indeed, some readers might be disappointed by the story’s built up anticipation, which eventually runs the risk of producing ennui. And in “Saturday Night,” Mohan and Keya feel like fully realised characters, but we are not allowed a glimpse into the mind of the maid and thus remain at a distance from her. The stories in Difficult Pleasures, though unrelated, seem to share the same colour palette, as moods resonate across most pieces and complement each other without becoming repetitive. The collection offers graceful, lyrical writing and subtly surrealistic stories about confused, rebellious and brooding characters and their changing urban lives, relationships and ambitions. The book has been long-listed for the Frank O’Connor International Short Story Award, and it represents an important contribution to modern Indian writing in English for its distinct voice and original style. “Difficult Pleasures is a reminder of what classic short stories are like, and that the most eloquent authors let their characters do the talking.” Full review in Timeout (Delhi, Mumbai and Bengaluru editions).